Justin Sutherland strikes a pose in the rain. The striking architecture of Caesarea-by-the-Sea was erected between 22-10 BC by Herod the Great. At the time, structures such as this theater were foreign in the Heartland. Herod accelerated the import of technology and the culture of the West and put his Eastern domain on the map. This opulence in stonework is nowhere as visible as in the Roman theater pictured here, the first of many built in the region. The featured stone of the Caesarea is kurkar, a local sandstone. Photo taken by Bible Land Explorer Jess Poettker. Jess (left) and Justin (above) are a part of the residency program of Johnson University. This program leads to a Master of Strategic Ministry degree. It involves a collaborative relationship between JU and local churches and is designed to equip students for effective, strategic Christian leadership. It includes a study-tour to Israel/Palestine. To learn more about JU’s residencies, see the link here. The response of an organism to external stimuli varies widely. Some pray. Some curse. Some alternate between the two. 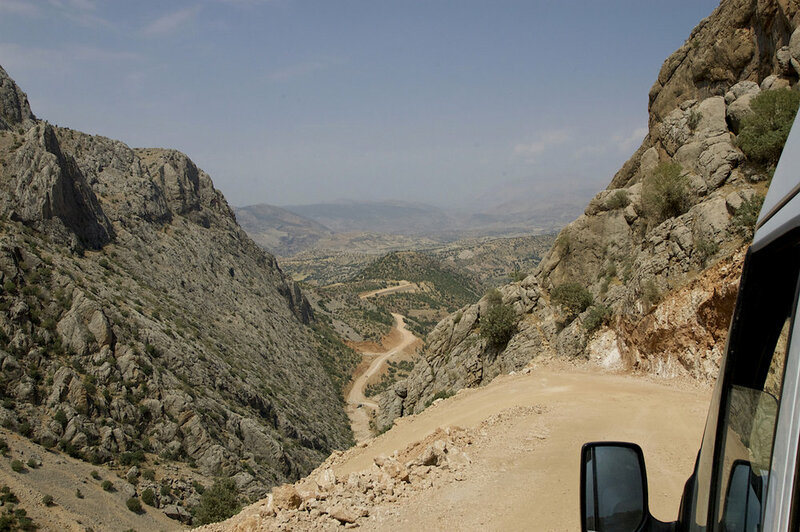 The narrow and unimproved road between the Cendere Bridge and Nemrut Dağ elicits a wide range of responses. Put differently: the lack of guardrails means that every rocky cliff, yawning chasm, and eroded roadwash may be fully appreciated without obstruction. Nimrut Dağ is a 7,000 foot mountain in southeastern Turkey. It is one of the highest peaks in the eastern Taurus mountains. Travel in Eastern Turkey is tough these days, but trips to Israel-Palestine are in full swing. We have openings right now for trip scheduled May 25 through June 4, 2019. Inclusive price out of Washington Dulles is $3,963. Other departure cities are possible. Write me at markziese@gmail.com for more information or check our full list of study-travel opportunities here. Refreshing in a map and compass navigation class. Yup, it’s old-school wizardry. None of that newfangled GPS stuff for these grey boy scouts. A compass does one thing: it points to magnetic north. If you use a map, remember declination. West is best; East is least. By the way, declination is the boogery part. Hang with me and you won’t get lost. Okay, maybe we will but at least you’ll be in good company. Consider joining us in Israel-Palestine this summer. We have spaces available on three different trips. Find the dates here, then email me at markziese@gmail.com for details. Getting out of Nazareth is one of the first obstacles for the Jesus Trail walker. Several colluding conditions make this challenging: the urban maze, steep stairs, and, at some times of the year, the heat. The first time I hoofed it out of Nazareth (2013) was in the depth of the summer. I couldn’t do anything about the stairs, but I beat the heat by starting before sunrise. Somewhere along the way I turned around and clicked this picture. Modern Nazareth is a community built in a geographical “bowl.” At the center of the bowl (like the omphalos of a ceramic vessel) is the Latin Church of the Annunciation. Here, according to tradition, was the boyhood home of Jesus. The hills of Galilee rise on all sides. 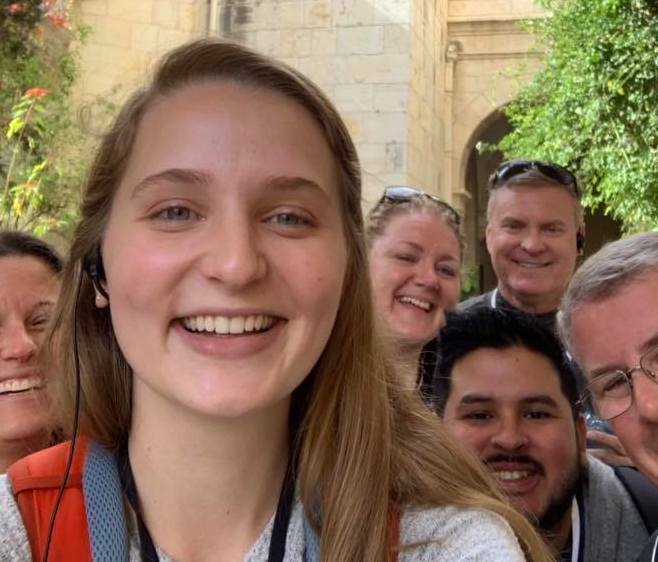 Seats are available on three different trips scheduled for Israel/Palestine in the coming summer. Dates of travel are May 25-June 4, June 4-15, and June 26-July 7. The window for sign-ups is closing, so move with speed. For more information on pricing, itinerary, or other details of these educational tours, drop me a line at markziese@gmail.com. For a full list of future travel opportunities, see here. Olive trees are gnarly and stubby. They are heavily pruned over the course of decades (and even centuries!) in order to maintain the canopy, eliminate dead wood, and maximize the production of fruit. Their grey-green leaves shimmer in the wind and offer contrast to the yellow-green grassy carpet. The hills of Lower Galilee rise in the distance. Our next experience in the land of the Bible is slated for March 12-23, 2019. We’ll be doing a study-tour with Master’s-level students in Johnson University’s residency program. Student trips are always fast-paced, high-energy, and full of great conversation. For a complete list of travel opportunities in 2019, see our schedule here. A rainbow appears in the sky after a winter rain in Lower Galilee. It arcs toward the broken remnants of volcanic activity on the right side of the image. These elevated heights are known as the Horns of Hattin and are famous as the battle site that brought the 1st Crusade to an end in AD 1187. The war-bows of Salah-ed-Din won that day. 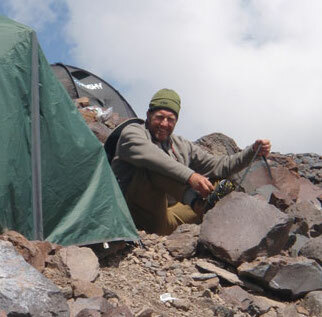 For more on bows and rainbows, check out our observations from the slopes of Mt Ararat. You can find it here. I shot this image while soloing the Jesus Trail a few weeks ago. The descent between the Horns of Hattin and Nabi Shu'ayb has some short, steep, but manageable drops. I suppose some might try it in flip-flops but with lots of boulders, slippery mud, and a pack on your back, I would encourage a more stable trail shoe. Apart from wind and mud, our January trek experienced good conditions everyday. Note the (1) bovine welcoming committee below, and (2) the limestone quarry biting into the hills of Galilee (near Turan) on the distant horizon. I’ve offered tidbits about the history and our experience of the Horns of Hattin elsewhere. See here and here for example. I believe this photo came from the camera of Bible Land Explorer Gale Cochell (please correct me if I’m wrong!). Our most recent group of Bible Land Explorers just completed a walk along the Jesus Trail, a 65 km trek across Galilee. The Trail crosses the traverses the Horns of Hattin as it approaches the Sea of Galilee. It is tough to complain about winter temperatures in the Heartland when much of the US is being blasted by arctic air today. Winters in Galilee are wet and cool (40s and 50s F). It can drop below freezing and snow does fall, but it doesn’t stick around very long. I’ve hiked the Jesus Trail four times in January. Twice we experienced clear skies. Twice we were washed regularly by cold rain. We always got muddy. Winter hikes are an iffy proposition. Come prepared if this is your choice. Of course, you can try it mid-summer. I’ve hiked it a couple of times in July and got baked. Go figure. I shot this image of a January sunset from the window of my hotel room in Kibbutz Lavi. Our most recent group of Bible Land Explorers just completed a walk along the Jesus Trail, a 65 km trek across Galilee. The Trail crosses the Plain of Gennesaret as it approaches Capernaum. Thick vegetation crowds the path of the Jesus Trail as these Bible Land Explorers approach the Sea of Galilee. There is topsoil and water in abundance on the Plain of Gennesaret. Three streams, the Amud, Tzalmon, and the Arbel run through the plain and bequeath it with gifts. Areas dedicated to agriculture today produce bananas and mangos. Jesus was familiar with this area and passed through it repeatedly. See Mark 6:53, Matt 14:34, and Luke 5:1-3. *See Zangenberg’s article on the Gennesaret in Jesus, Paul, and Early Christianity (2008: 454). The reeds along the edge of the Sea of Galilee provide the perfect habitat for many creatures including the hoopoe. While the rest of us were eating lunch, Susan, our birder, was hunting at water’s edge with her camera. She came back with a triumphant woop of her own; the hoopoe was on her Jesus Trail bucket list. *See article by Timothy Schum, “From Egypt to Mount Qaf: The Symbolism of the Hoopoe in Muslim Literature and Folklore.” Pp. 37-57 in Journal of Islamic and Muslim Studies 3/1 (May 2018). Our most recent group of Bible Land Explorers just completed a walk along the Jesus Trail, a 65 km trek across Galilee. We were lunching along the trail behind Kerei Deshe on the Sea of Galilee when Susan spotted the hoopoe. East Africa is not among the Lands of the Bible, but I can’t help but wave this paperback under your nose. 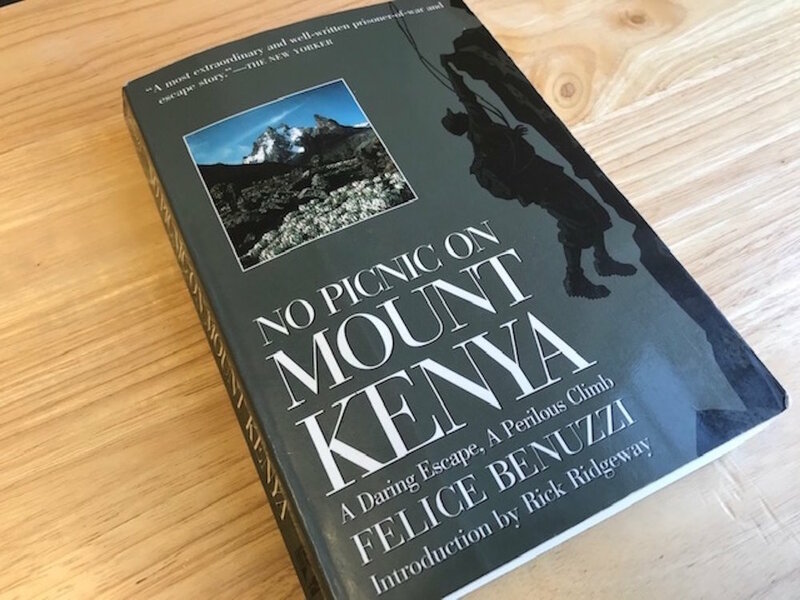 National Geographic considers Felice Benuzzi’s No Picnic on Mount Kenya (1953) among the best 100 adventure stories ever written. It is certainly the most entertaining book I’ve read in a long time. It unexpectedly combines two story lines: a daring escape by three men from a WWII prison camp and their attempt to climb a 5,000-meter mountain. The twists are many. Beyond the self-effacing humor embedded in author’s suffering and the creativity required to manufacture their own alpine gear, there is the purpose outlined from the beginning of the book: should they be successful in breaking out of the camp and making it up and down the mountain alive, they must then break back into the camp. It is a matter of honor. On the way out they left a note for the captors promising to return. I am no spoiler: the hero at the end of this well-told story is the indomitable human spirit. Benuzzi, far right, with friends from the prison camp. Image from here. In addition to our usual trips to the lands of the bible (see our 2019 schedule here), I think there might be a few more mountains in our future. The invitation is always open for you to join us—either on the heights or in the depths. Contact me at markziese@gmail.com for more details. I stand on the edge of the ancient site associated with the prophet Jonah. Today the hill holds an Arab village by the name of Mashhad. In the distance, beyond the immediate lines of trees, a dark hill rises with a square structure near the summit (look toward the upper left side of the image, about one-third of the way in from the margin). That dark hill and the slope that runs toward us is the site of Sepphoris. During the time when Jesus was growing up in nearby Nazareth, Sepphoris was being rebuilt as the urban center of all Galilee. Sepphoris and Mashhad are both sites along the Jesus Trail. Our most recent group of Bible Land Explorers just completed a walk along the Jesus Trail, a 65 km trek across Galilee. In addition to exploring Sepphoris, we visited Nazareth, Capernaum, Magdala, and Tiberias. If it has been more than five years since you have visited the Roman Catholic portion of the site of Capernaum, you will be surprised to see it today. The entry area, the plaza, the waterfront have all undergone significant renovation. The primary structures on display—the “White” synagogue and the House of Peter—appear as before, but other upgrades are striking. The entry area, the plaza, the waterfront provide improved accessibility, seating, garden, and devotional areas. The site has an occupation history stretching from the 2nd century BC to the 13th century AD. The name of the site originates in the Aramaic, Kefar Nahum, or “Village of Nahum” (but not that Nahum!). Our most recent group of Bible Land Explorers just completed a walk along the Jesus Trail, a 65 km trek across Galilee. In addition to exploring Capernaum, we visited Nazareth, Sepphoris, Magdala, and Tiberias. The city of Sepphoris was splendidly restored by Herod Antipas. According to Josephus, Herod “built a wall about Sepphoris, (which is the security of all Galilee) and made it the metropolis of the country” (Ant 18.27). Antipas renamed it Autocratoris, a term that may suggest the title of the emperor or the fact that the city was somehow politically autonomous. As I hiked by the site I was alternatively doused by sun and rain. Galilee in January can be that way. In this shot, the acropolis of Sepphoris rises on the left. The summit is marked by a Crusader-era stronghold. Buildings of the modern kibbutz spread in the foreground. Upper Galilee looms in the distance, wet and purple. Our most recent group of Bible Land Explorers just completed a walk along the Jesus Trail, a 65 km trek across Galilee. In addition to exploring Sepphoris, we visited Nazareth, Magdala, and Tiberias. Jesus Trail hikers pass through tropical orchards on the Plain of Gennesaret. It was a muddy go, but much improved from last week. The heavy rain has subsided and given us three lovely days of sunny skies. It was just enough to reach Capernaum. Just ahead: a lunch stop in a clearing overlooking the Sea of Galilee. 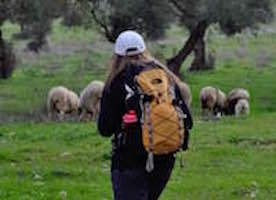 Our current group of Bible Land Explorers are walking the Jesus Trail, a 65 km trek across Galilee. In addition to hiking through muddy orchards, we are laughing, talking, and experiencing sites associated with the Gospel story.